The blades on my planer are needing to be sharpened. Our local sharpening service just went out of business so I was considering trying to sharpen the blades myself before having to go out of town for service. I have a Lansky sharpening system plus an off brand “V” type sharpener. Has anyone used these methods to sharpen joiner or planer blades? I would use a jig with sandpaper on granite for such a wide blade that needs to be uniform across the surface. The problem with using the Lansky for that, even assuming you could get the jig to that angle, is that as the stone pivots to the side of the slot in the jig, the angle changes and becomes shallower. That’s also a factor on long knives. I understand the desire to do it yourself. I don’t know what the blades come off from but I can get some 12 1/2” ones for my dewalt from amazon for about $35. Double sided so they’re like two sets. Jointer blades are around $16. Not worth the effort to try to get them sharpened right for me. Thanks all for the replies. 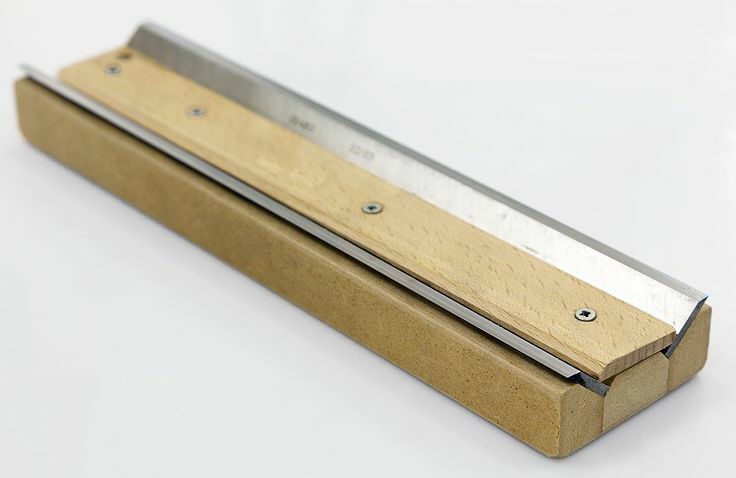 I am a novice at woodworking but hear about using sandpaper for sharping a lot, as in the above post. My thought would be that the sandpaper would not sharpen the metal blade but I am evidently mistaken. Is there a certain type or grit that I should use? Probably my best bet would to just take them to a professional sharpener or purchase new. Unless your blades are badly nicked, your best option is a jig like the one Rich is posting and either, sandpaper (220, 360, 400 and 600) or water stones, you will save a lot of money, buying new blades or getting them sharpened by a pro gets expensive over time and it is really a simple procedure. Mario, is this just typical sandpaper or does it take something special? I don’t think the factory edge is ready for use on new blades. I have a Tormek with the planer/jointer attachment and sharpen and hone even new blades. To use a jig like the one I posted a photo of, you’ll need a flat surface and wet/dry paper. You can get a 1/2” glass plate for the surface and some 600 and maybe 1500 or 2000 grit wet or dry paper. Use a spray bottle and spritz the glass so the paper will stick to it, then spray the paper and grind away. A sharpie is useful to gauge your progress. Use the sharpie to color the flat of the blade so you can see how flat you’re getting it. Once the ink is completely gone, the faces are flat and you should have sharp blades. You can remove the burr by rubbing the backs of the blades on the finest paper you used while it’s still on the glass plate. Finally, honing on a leather strip with compound will get it razor sharp, but don’t sweat it if you don’t want to bother. It’s easy on the Tormek, so I do it. Rich, if I would build the jig as shown, how do I determine the proper angle? Is this guess work or can I find specs for that particular blade? You should be able to approximate it based on the current angle on your blades. It’s not critical that it be precise down to the degree, it’s mainly important that the edge is straight and true. That’s why you need a glass plate or some other very flat surface. I think that I have adequate information now to handle my situation. I am new to Lumber jocks and appreciate all of the reply’s and help that I received.